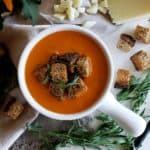 I couldn’t think of a better recipe to help us transition from summer to fall, and it’s this creamy tarragon & manchego tomato soup. So, I think this is true for most, but whenever I think of fall, I first think of soup (…and really decadent cozy desserts, but we’ll save those for another day). 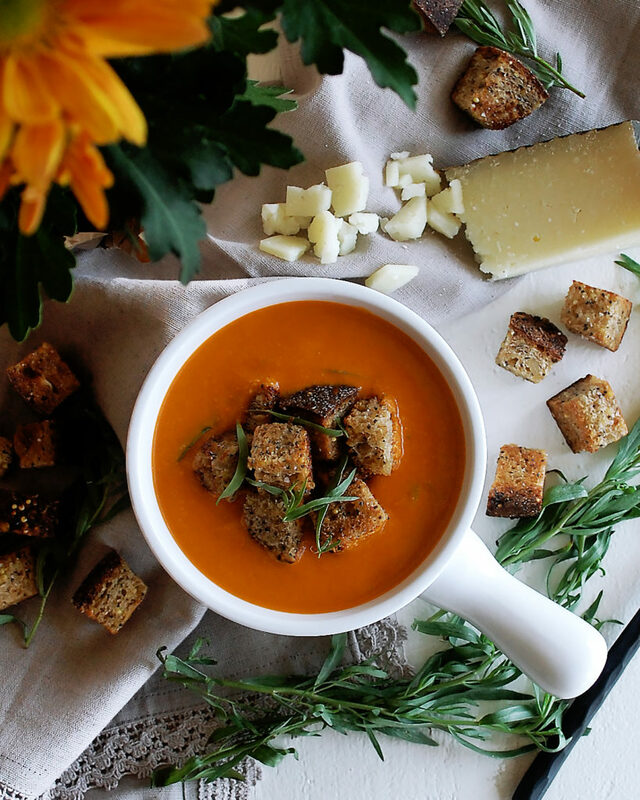 Chillier weather, long days apple picking, cozy nights at home, and a big bowl of soup…it all just works. 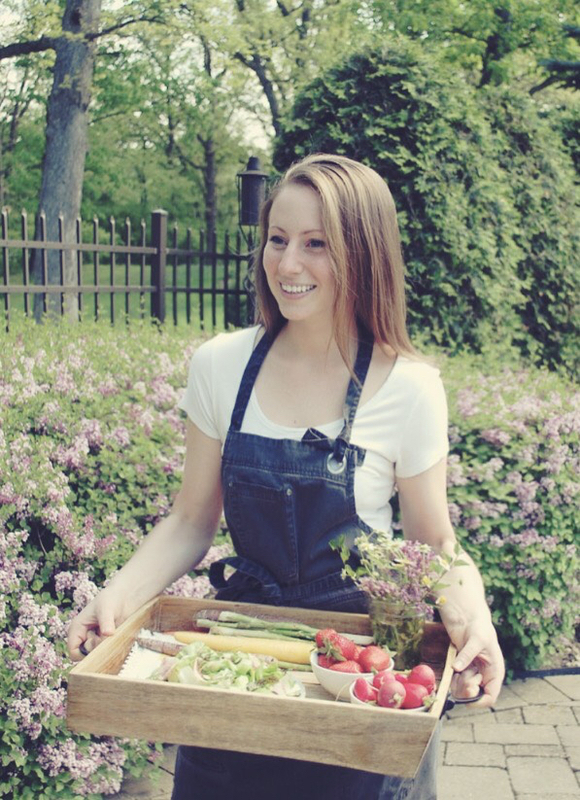 That being said, it is only September, and we’ve still got some absolutely beautiful late summer produce at the markets. Especially tomatoes. I think tomatoes actually are at their very best in September. So, the result? 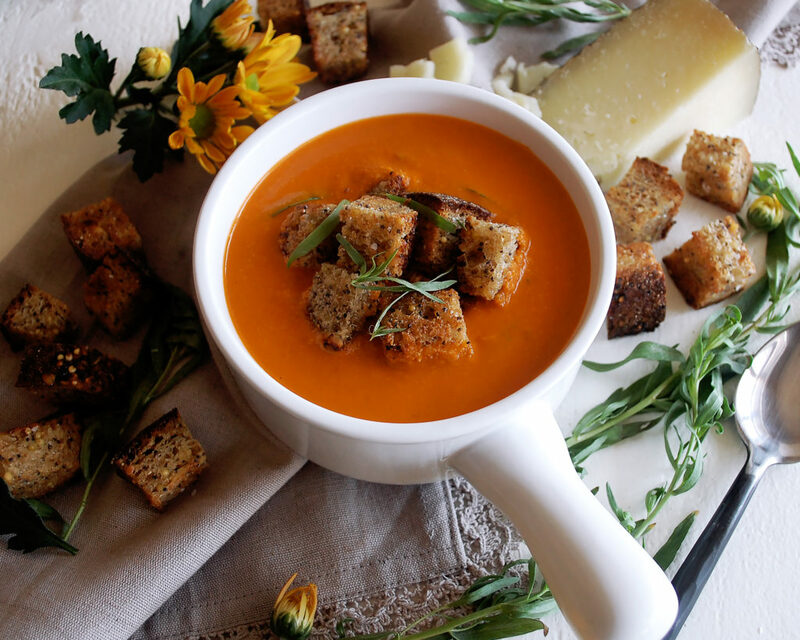 We are getting the best of both worlds and making a really luxurious tomato soup. Now, when I say luxurious, I don’t by any means mean complicated. This is actually probably one of the simplest things to make. It’s usually my go-to for weeknights when I only have about 20 minutes to spend cooking, but still want something that is full of flavor and comfort. See what I mean? Nothing crazy, just really good ingredients blended together into an addicting combination. 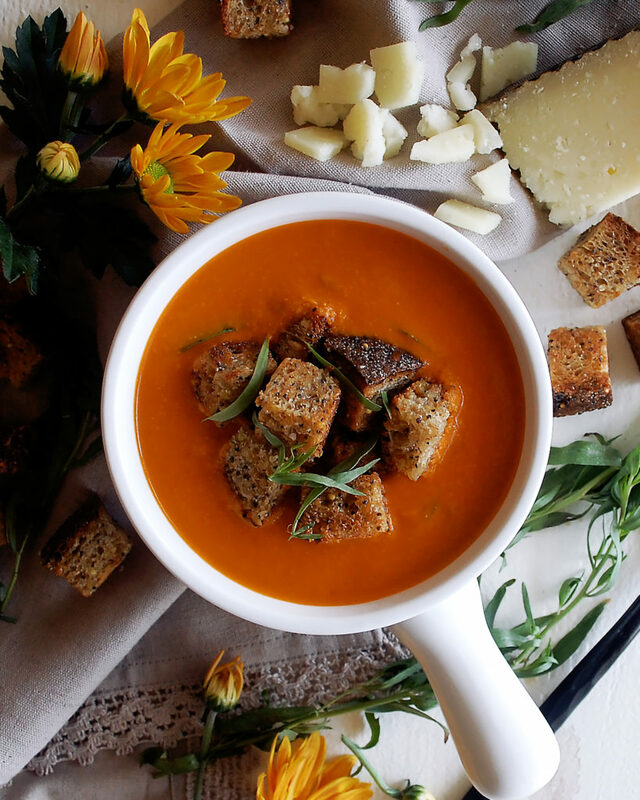 Especially adding the cheese…I mean who wouldn’t want a cheesy tomato soup? And that is basically it! I fry up some seedy bread to make the best croutons for the top. After that, I’ll usually throw together a hearty salad and call it a night. This soup is such a great recipe to have in your back pocket for a night you just need to relax and whip up something simple. And trust me, the smell of the soup cooking alone will allow you to completely just enjoy the moment. So, go grab some tomatoes before they’re gone! (And then we’ll just have to do all things apples, squash, and pumpkins…which I can definitely work with.) Enjoy! Heat a large heavy-bottom pot (I use a Le Creuset) over medium heat. Coat the bottom with a drizzle of olive oil. Add the onion and let sauté for a few minutes until soft and translucent. Add the garlic. Sauté for 1 more minute. Add the tomatoes and stir to combine. Bring the mixture to a bubble over medium-high heat. Lower the heat back to medium and let the tomatoes simmer for about 10-12 minutes, stirring often. You want the tomatoes to burst and the liquid to reduce. Season well with salt and freshly cracked black pepper. Add the ¾ cup of tarragon. Transfer the soup to a blender (you may have to work in batches) and blend for 1 minute until smooth and creamy. Return the soup to a clean pot. If you have done this quick enough, the soup should still be fairly hot. If not, you can heat it over low heat (just be careful not to scorch the soup). Add the shredded manchego cheese and stir until it melts. Lastly, add the honey, heavy cream, and remaining tarragon leaves. Taste the soup and adjust the salt and pepper if needed. Meanwhile, heat about ¼” of vegetable oil in a large, shallow sauté pan over medium heat. When the oil is hot, add the cubed bread. Continually stir the bread as it toasts in the oil, about 3-5 minutes. Once crispy, yet still soft on the inside, use a slotted spoon to transfer the croutons to paper towels. Immediately season with salt while the croutons are hot. 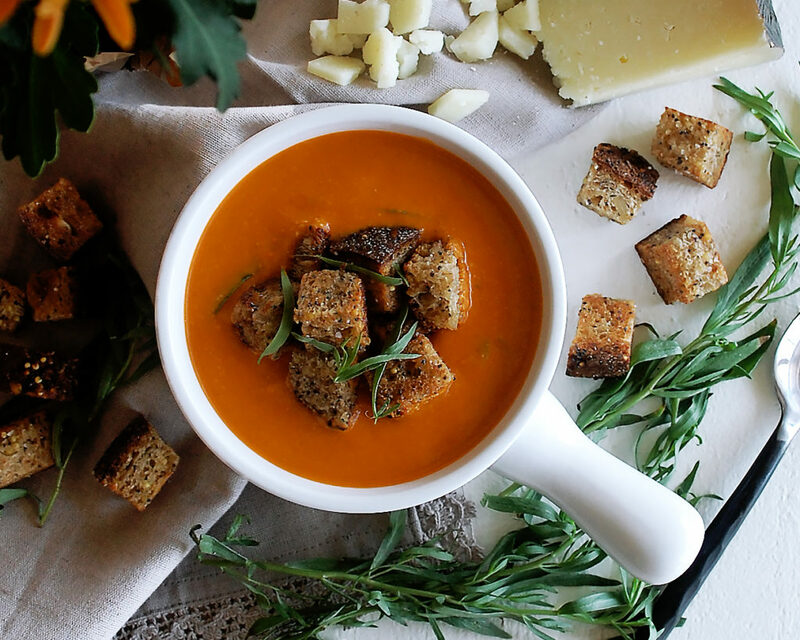 Serve the soup warm in a big bowl with the homemade croutons and a few extra tarragon leaves on top. You could also drizzle some olive oil or grate some manchego cheese over top.